A project shouldn’t have to fall through just because your budget was off or something was miscalculated while you were focused on other tasks. This template makes sourcing project costs, managing costs over time, and monitoring all this data easy and simple. You’re already dealing with the stress of overseeing a project, so why add more stress worrying about the financials? That’s where the budget template comes into play. By separating your budget into four different categories in the first tab: design, development, delivery, and management, you can see where your expenses are going at all times. The second tab allows you to keep track of expenses that have continuing costs, such as planning and labor. The third tab gives you a convenient visual of your projected costs against what your actual costs are, so you can keep on schedule. The forth, and final, tab gives you an overview of your monthly costs with simple numbers. Customize any of the tabs or cells to fit your unique project, and then simply plug in your expenses. The tabs can be easily edited to fit your needs and point out if you’re on track with your estimated budget. 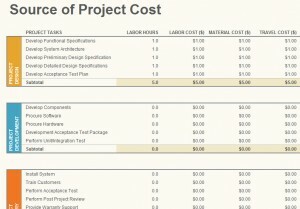 It can be a nightmare to receive a bill after a major project, especially when that number deviates from your original projected cost by a substantial amount. By keeping track of every facet of your project, down to the last detail, you can avoid this shock, and even save money by simply knowing where your money is going. This template allows you to monitor key elements of your project and allow you to shift the numbers in your favor as soon as you encounter something that can be changed or fixed.